First, I will explain you the Basic Casino Strategy. It is independent from the game you will end up playing. It is a common strategy for all kinds of casino games like Roulette, Black Jack or Slot Machines. In the next article I will introduce you to the particular strategies for the mentioned three games. Is there an optimal strategy for gambling? First of all: all online casino games except Poker depend on luck. The rules of Roulette, Black Jack or Slot Machines are set in a way that in the long run the house will always win. Therefore, in the long term it is not possible to earn money playing in casinos. Certainly, it is possible to have a lucky streak or leave the casino as a big winner at some nights, but in the long term the money will always stay with the house. Unlike Poker where you play against other players and where you can make money using the optimal strategy casino games are a losing deal. For this reason it should get clear that there are no professional Roulette players and that you should focus on how to get the most fun of your money before it ends up with the house. With the following strategies I want you to achieve that objective: amusement for a long time. Let me explain you this in detail. Bankroll Management is a very important term for all games that are played for real money. This applies not only to casino gambling but also to games of skill like Poker or to investments in stocks. Our player didn’t make any loss in just over 5% of the cases. More than every twentieth casino night ends for our virtual player with the same amount of money he started with – or even with a profit. In 50% of the casino visits with 100 games of Roulette our player lost less than 8 bets. In 95% of the cases the loss was less than 21 bets. 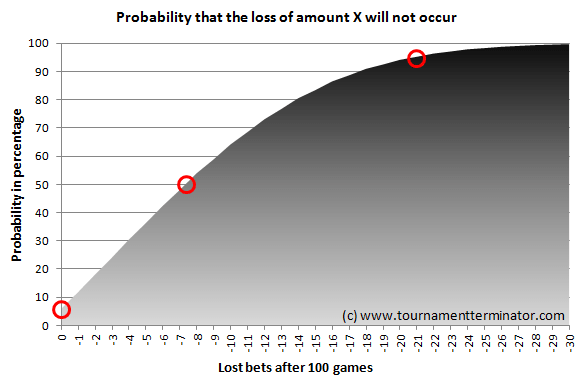 This means that only once out of 20 times more than 21 bets are lost in 100 games. What does that mean for you in concrete terms? Only bet a small fraction of your capital each time, and only play even bets (single-chances). Playing Roulette your deposit shouldn’t be more than 1/20 of your money. Then there is a probability of about 95% that you haven’t lost all your money after playing 100 games. A concrete example: If you have a total amount of 200 USD to play Roulette in a casino you shouldn’t bet more than 10 USD each game to make sure you can play 100 rounds – what means lots of fun for a long time. Playing Black Jack using Bankroll Management and betting 1/20 of your capital each time prospects are even better. With the optimal strategy your expected value is more than 0,99 while it is 0,973 at the Roulette table. Hence, using this strategy it gets almost impossible to lose all your money. This is not exactly true for slot machines. We will come to that later. But there you are better off playing slots with the lowest deposits. There has already been much debate about the doubling strategy, also known as the Martingale Betting System. It is about doubling your deposit with every loss. The thought is that you will win sooner or later playing single chance Roulette games (and Black Jack where the probability of winning one game is approximately 50%). So losing first 10 then 20 and 40 USD and winning then 80 USD will result in an overall profit of 10 USD what is equivalent to the initial deposit. Named after its inventor the Martingale Strategy doesn’t work though because casinos set minimum and maximum deposit amounts. So there is only a certain number of doublings you are able to conduct and it is just a matter of time until you lose your bet of 2,560 USD (after losing 8 times in a row). Despite that something seems not right when betting over 2,000 USD to make a profit of 10 USD. As a result you risk to lose big amounts of cash while only having the chance to make tiny profits. This strategy that could be called the Anti-Martingale-Strategy is much nicer. It reduces loss risk but offers good prospects for higher profits. Therefore, it is more diversified and ensures a bigger level of thrill compared to the previously described Bankroll Management where single-chance only games are played with constant equal deposits. That is how the strategy works: once again, you play Black Jack or Roulette with even bets, e.g. red or even numbers. You play with 10 USD. If you win you leave your initial deposit plus profit on the table. Now you play with 20 USD. If you win now you leave everything on the table again. Now you play with 40 USD. If you win you put the 40 USD profit in your pocket and start again with 10 USD. Of course you can speculate on even higher winning streaks. Your profit doubles but the probability to win the full streak is cut in half with every game. Independent from the chosen strategy you should always walk into the casino with a fixed amount of cash or deposit small amounts when playing online . Leave your credit cards at home or if you gamble online keep them without reach. In the worst case scenario you will then only lose as much as you brought with you or deposited into your account. What doesn’t work with impulsive players is to buy chips for 100 USD when having another 200 USD in your pocket. Too often gamblers will then turn the additional cash they didn’t intend to use for gambling into chips and then will lose that amount as well. This is also true when playing from home. Set your limits and hold on to them. If you feel like you cannot keep your limits you should ask your casino to lock you out for a certain time (unless you won). Another strategy is to set a certain time window for you to gamble. The less time you spend in the casino the less time you have to lose your money. Because there are no clocks in casinos (to take away any sense of time) and the software of your online casino might cover the time display of your computer, the best way is to set an alarm on your phone, e.g. in 2 hours. When the alarm goes off you stop gambling and won’t place any more bets on that day. Online casinos spend tons of money to acquire new players. That’s why you will receive a sign-up bonus at every casino you register at for the first time. This bonus may be up to a few thousand USD and depends on your initial deposit. For example, a 200% bonus for up to 3,000 USD means that you receive additional 200% when depositing 1,000 USD. So you can gamble with 3,000 USD although you only deposited 1,000 USD. So is makes more sense to pay in a larger amount of money for your first deposit. Often there will be “reload-promotions” which might not be that lucrative though. Some casinos even started to give away credit for free. Using that “no-deposit-bonus” you get a few dollars of real money without ever depositing anything. Of course the casino is trying to make you pay in your own money at a later point of time in case you liked gambling with them. This way, costs of a “no-deposit-bonus” are covered quickly. Bonuses and promotions are the easiest way to reduce your disadvantage you usually face when gambling. You even might be able to turn that into a little advantage. In the long run it is not possible to earn money with gambling unless you make optimal use of bonus promotions. This is why you have to try to minimize your losses. This is easiest when sticking strictly to bankroll management and place even bets. In my simulation I showed you that you are likely to play 100 games of Roulette without going broke if you don’t bet more than 1/20 of your total amount each game. The aim of this strategy is that you will be able to play as long as possible and have fun. The goal is not to become rich or quit your job as profits in the long term are not possible. If you want to learn more about game specific strategies, then continue here where we discuss strategies for Roulette, Black Jack and Slots.